Portable monitor tester for PC, SUN, and MAC monitors. 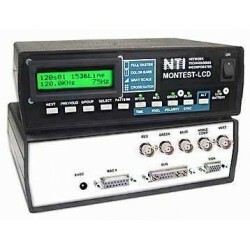 The newly designed MONTEST-LCD Signal Generator is an easy to use, portable instrument for testing, repairing and aligning analog computer monitors, LCD displays, and video projection systems. Use the MONTEST to cut repair time and reduce equipment downtime. Repair computer monitors at the job site, eliminating the need to disconnect the monitor and transport it to another location for testing. Projectors can be aligned onsite, without the host workstation being present. Easy to use push button operation including last setting memory. The last user settings selected restore at power up. A microprocessor and programmable logic-based design provide significant performance improvement over the common memory-based monitor testers. Up to one hundred scan formats are available, including all current VESA standards and most fixed frequency monitor scan formats. Additional scan formats can be added. Four video output connections for direct connection to PC, SUN, MAC and BNC monitors. Versatile and adjustable sync outputs for composite, sync-on-green and horizontal & vertical and polarity settings. The LCD display clearly shows the selected scan format, pattern, and output options. The LED indicators show the status of the video output. Optional 10 minute timeout on video to prevent CRT burn-in. Auto sequencing through the patterns to burn-in monitors. Pixel size of 16 or 31 nanoseconds. 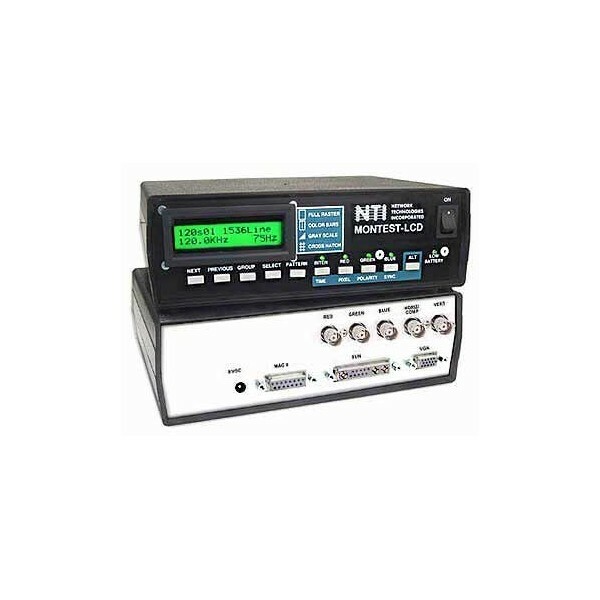 Over 100 frequencies cover a wide range of monitors, including all industry standard PC, MAC, and SUN frequencies. Four video patterns with 16 colors and intensity control provide all the patterns and colors normally required to test and align any monitor. RGB: 700mVpp (terminated into 75 ohms). All outputs are protected and limited to .7 to +5.7 volts. LCD display shows scan format, pattern displayed, and output options selected. Accepts 9-15VDC, 500mA via AC adapter (not included). Optional 6C size alkaline batteries (not included). Runtime: more than 6 hours. WxDxH (in): 8x6.6x2.7 inches (203x168x69 mm). 2.8 lbs (1.27 kg) with batteries. 1.6 lbs (0.73 kg) without batteries.